The mountainous state of Colorado features an incredible landscape combining desert, Rocky mountains and river canyons. Famous for its world-class skiing, Pike’s Peak and the world’s highest highway, Colorado is the ultimate destination for outdoor adventurers with its endless recreational offerings including kayaking, hiking and winter sports. From breath-taking national parks to cosmopolitan cities, Colorado is home to some of the best museums, galleries and cultural centres in North America. 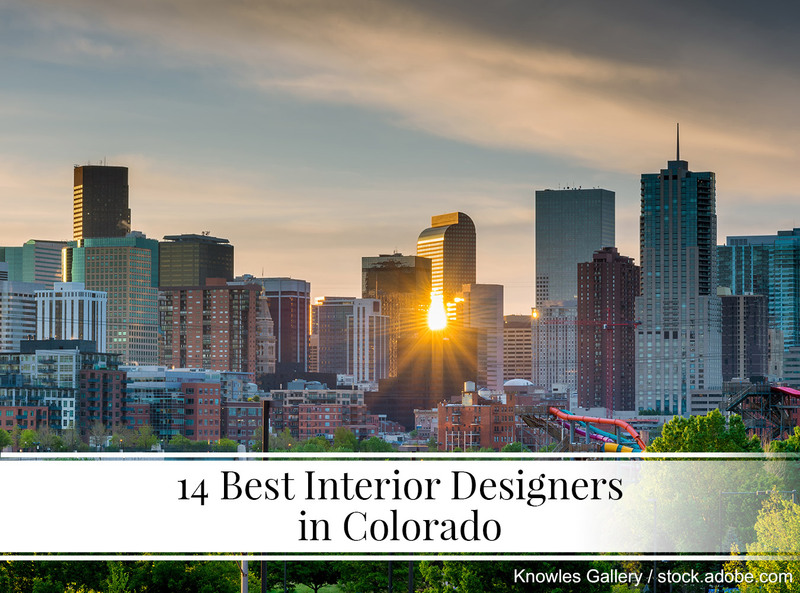 Unsurprisingly, the state’s long tradition of the hosting incredible cultural events and arts festivals has inspired the creativity amongst its 5.6 million residents, more specifically its interior designers. At 328 Design Group we value function first, followed beautifully by form. 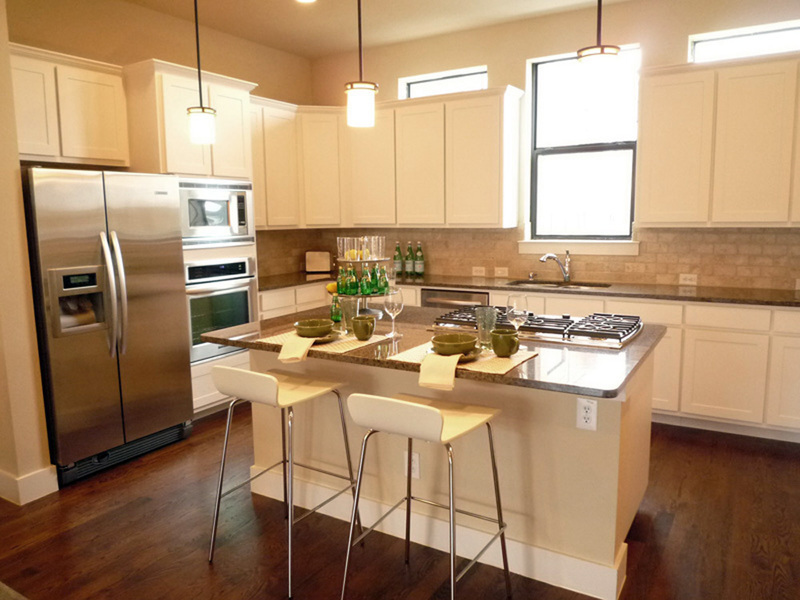 We craft spaces that embrace the end user by focusing on each client’s goals and priorities for their home. On this project we learned our clients loved to host, but entertaining felt cramped and isolated by their small kitchen and broken up main level . We set out to create a space that could easily host 30 or more for a large celebration or seat 12 comfortably for a more intimate dinner party. Opening up the entire main level allowed our clients to prep, chat, and entertain with everyone, eliminating the isolation from the old layout. 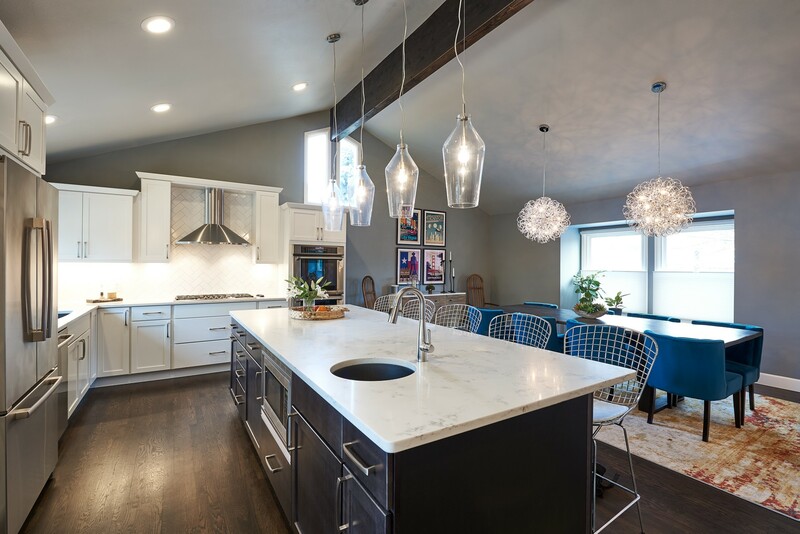 Once opened up, the kitchen was finished with a modern edge, focusing on a large island with contrasting cabinets to gather around and eye-catching lighting to provide an atmosphere of celebration. 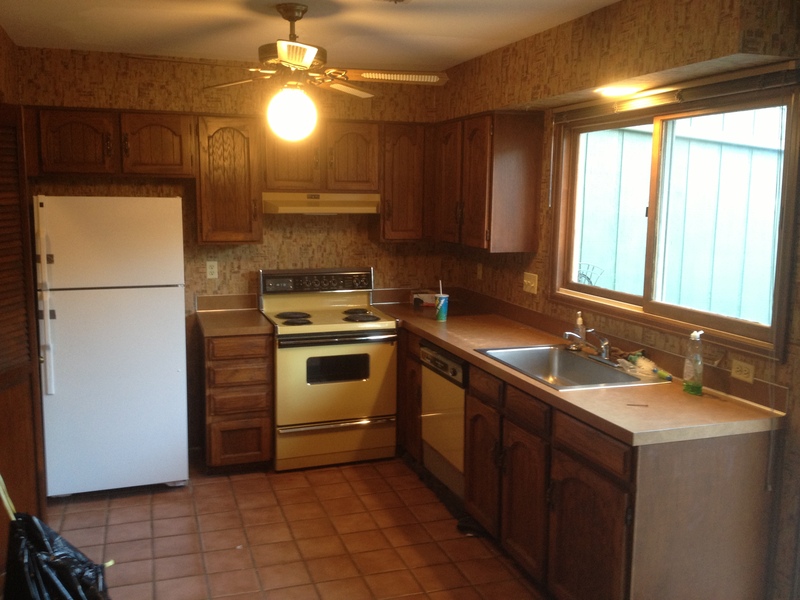 This is home to a couple and their 3 daughters and yet in the before photos, you can see it in no way reflected the youth and vitality of the family living there. The goal was to lighten and brighten the areas and provide comfortable areas for family and friends to gather. I wanted to create distinct living areas that were still cohesive. An added bonus, a result that feels both carefree and sophisticated. 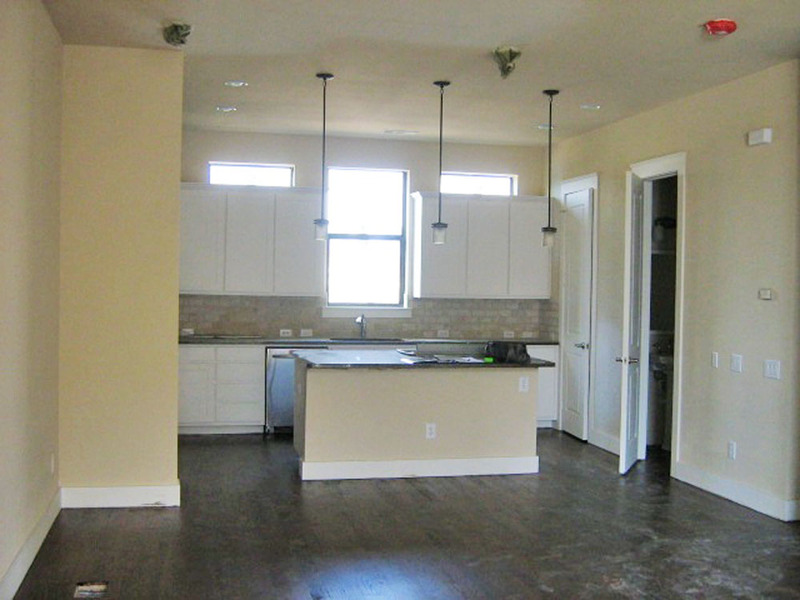 It now serves as the perfect space for family living as well as entertaining neighbors and friends. A perfect reflection of its inhabitants! When a busy couple with one child wanted to relocate to Colorado, they purchased a modest town home with lots of potential. They enlisted Beautiful Habitat to help them turn the dated space into their dream home. In stages, the cramped, dated 1970s town home took on a whole new look and feel. One of the first challenges was to help the family downsize into this smaller home and create more storage and functional space. This started in the kitchen. 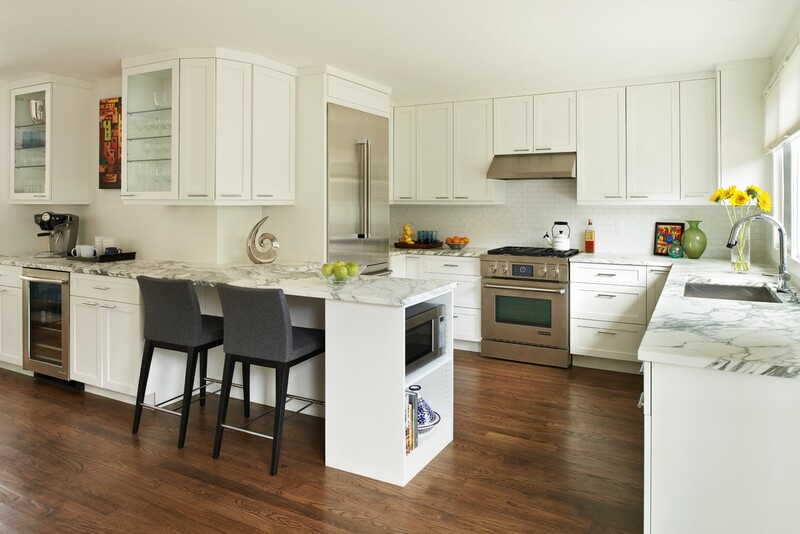 Efficient use of space and cabinets that reach the ceiling maximize storage, while creating zones, such as a beverage zone, improves functionality. The peninsula provides ample space for eating as well as doing homework. And the family can comfortably entertain here. 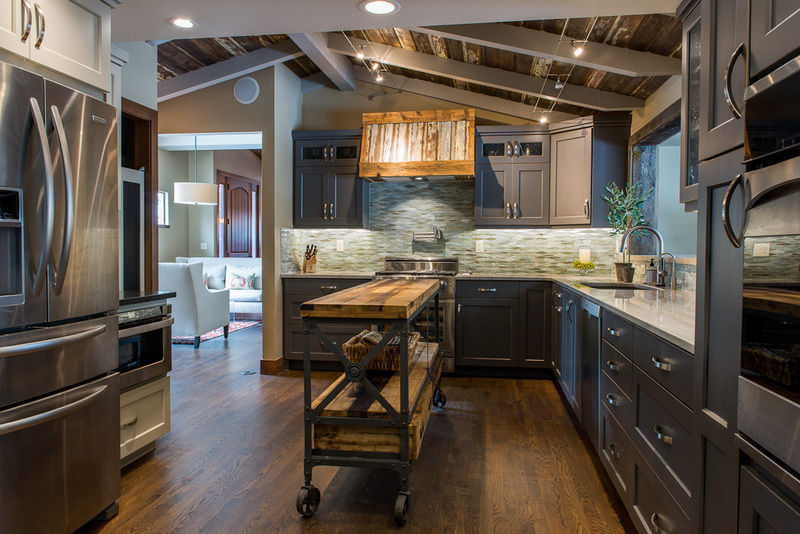 The kitchen is a National Kitchen & Bath Association award-winning design. This was an amazing project to work on with even more amazing clients! 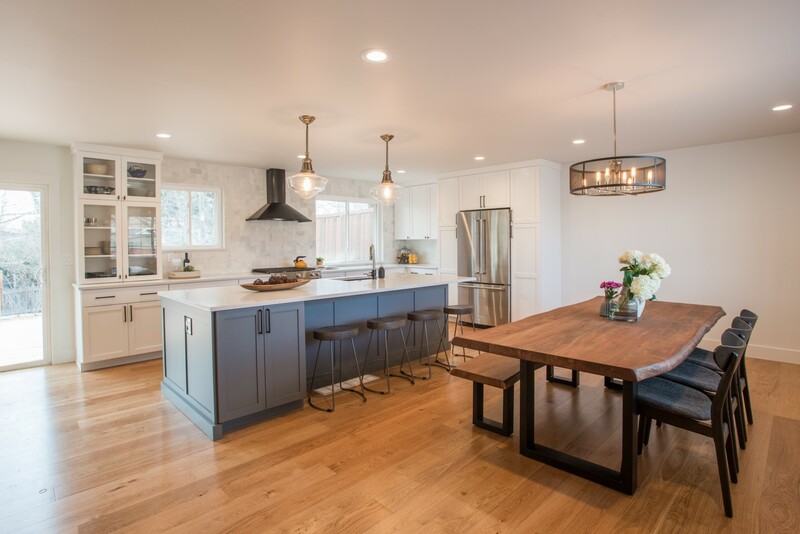 This renovation project, we opened up the space plan and integrated the kitchen and the living room so that the client could more easily entertain friends and family. We used the back wall as a focal point, selecting a black hood with a beautiful tumbled marble backsplash with an very interesting pattern that goes all the way to the ceilings. We also decided on a natural walnut Scandinavian hardwood floors that bring a great modern farm house feeling to this home. 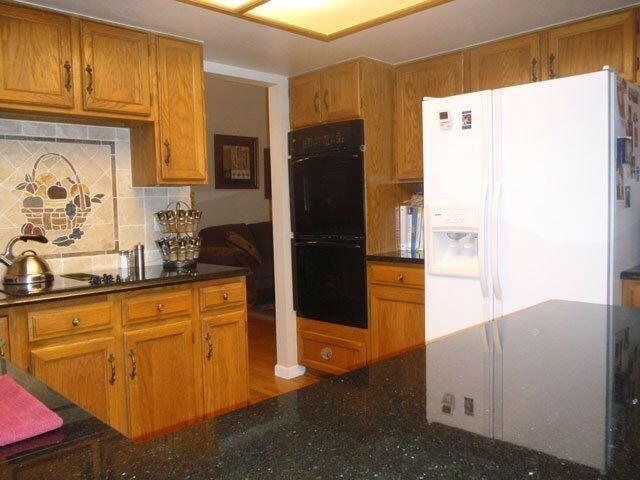 Our client wanted to update their large family home where she often cooked dinners for her children and grandchildren. The kitchen was separate from the rest of the house and she felt isolated from the large family gatherings while cooking. We opened up the wall between the kitchen and the great room, gutted the kitchen and 5 bathrooms, added wood floors and lighting throughout, along with a myriad of other high end upgrades. 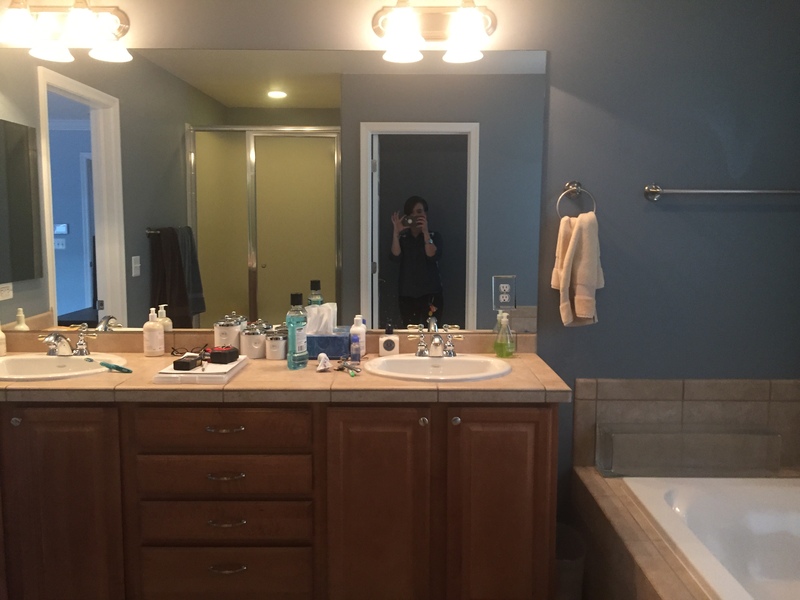 Our client says; “Sarah was very helpful in guiding us to the appropriate vendors, narrowing down finishes and listening to our wants and needs of the remodel. Sarah made on sight inspections to make sure our visions were coming together during the construction. 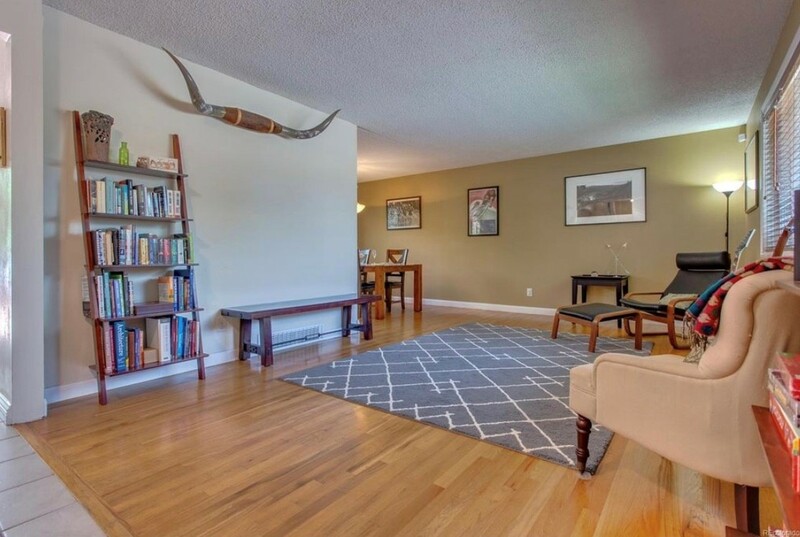 We are delighted with our home and thankful for Sarah’s knowledge and experience! Hampton Redesign created a contemporary model town home design for an urban infill project. Most of the furniture was sourced through West Elm and accessorized with both modern and vintage accents. The entire second floor was open plan with kitchen, dining and living area connected so it was important the color palette flowed. To offset the neutral walls and floors, I chose accents of green, gold and orange. The builder’s only request was to use West Elm if possible, which gave me a lot of flexibility to choose the right pieces I felt would best appeal to a single professional buyer. 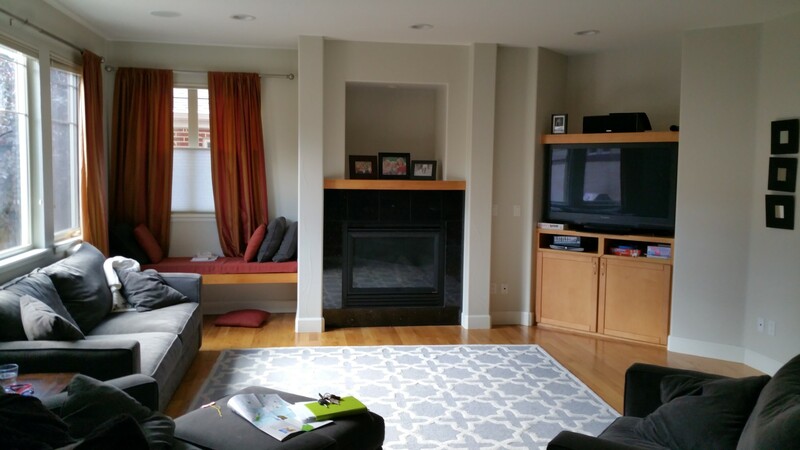 This project was a full home remodel in Denver, Colorado. 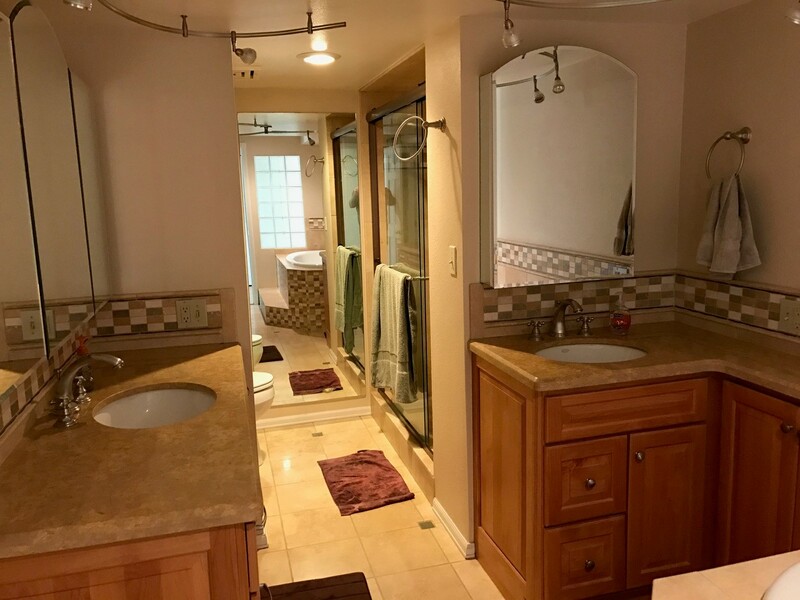 The master bathroom had gone through a cosmetic update 10-15 years prior but no effort was taken to make the space more functional due to the location of the main plumbing lines and bathtub drain. The design intent was to create a master bathroom that had a spa-like feel and also functioned well for two users at the same time. 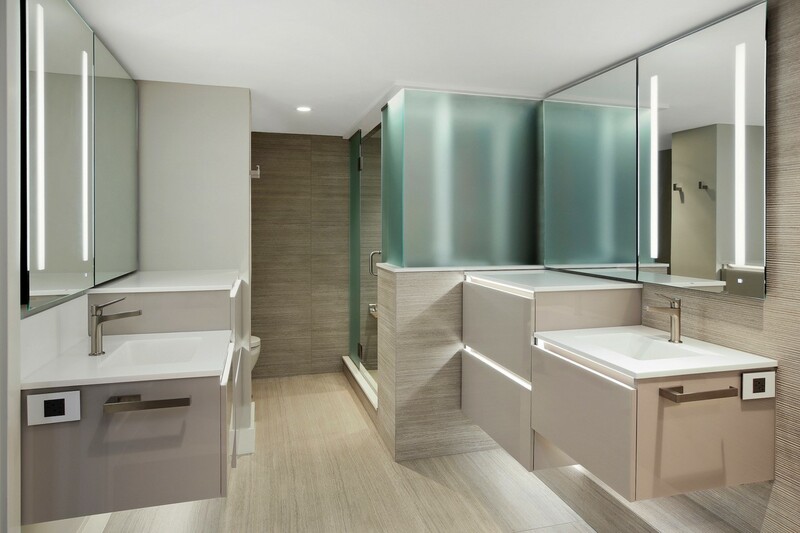 The new design has allowed the client to use the space much more efficiently while at the same time provided them an area to relax with the appropriate lighting, storage and amenities. 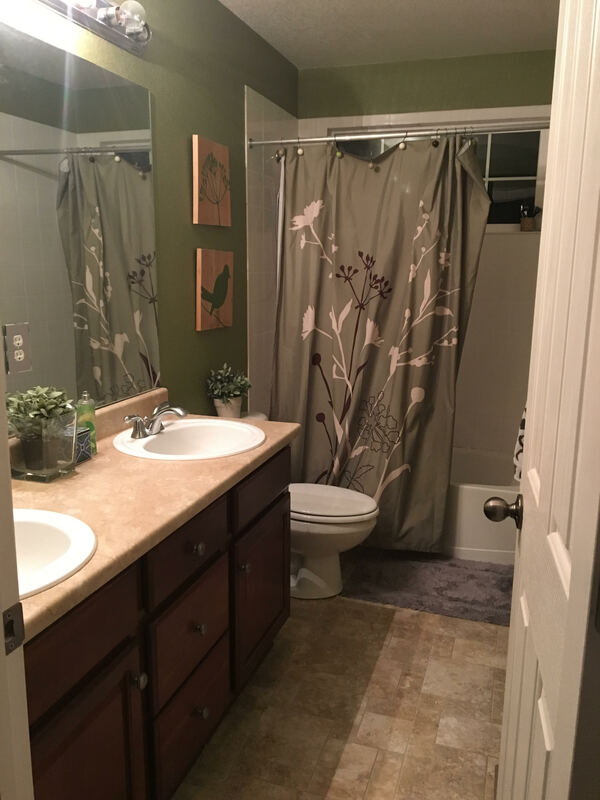 A guest bathroom should be welcoming and comfortable and fun, but from heavy-looking shower tub combo to outdated materials and fixtures and bad lighting this guest bath was dated, tired and worn-out. Keeping the same footprint as the original bathroom, we replaced the alcove tub with sleek and modern curb less walk-in shower with frameless glass, modern fixtures and small free standing stool instead of large built-in bench. Fun graphic wall tile at the shower back wall became the vocal point of the space. We replaced the heavy outdated vanity and 2 sinks with prettier and more modern vanity with drawers and one oversized vessel sink off centered to left leaving a larger counter space and fun rope pendant cluster above the counter space. 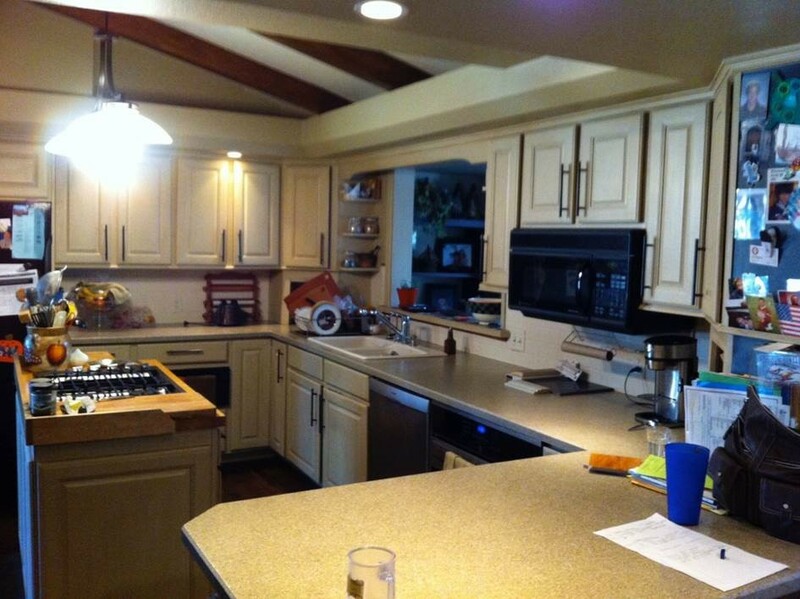 This client was looking to renovate her dark, cramped and dated kitchen into a more open floor plan with better flow, functionality, and of course design! 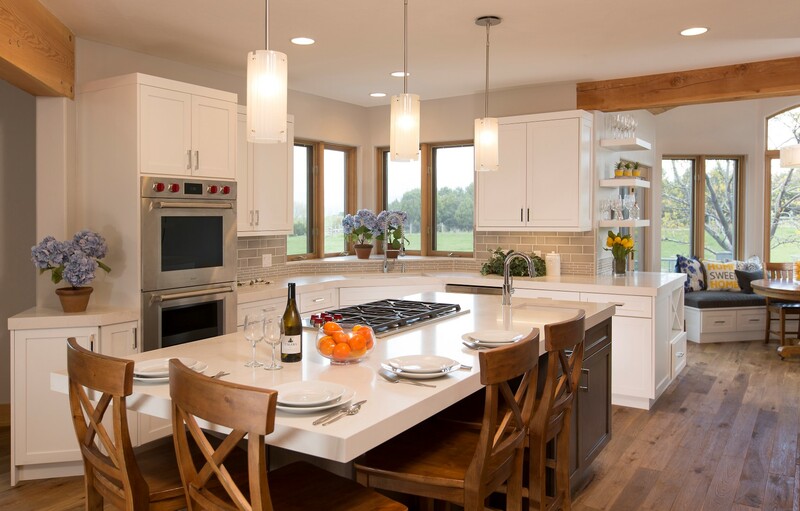 Susan Kosonocky and her team started by eliminating the peninsula, removing soffits and opening up the interior “window” to bring in light and create a more open and spacious feel. 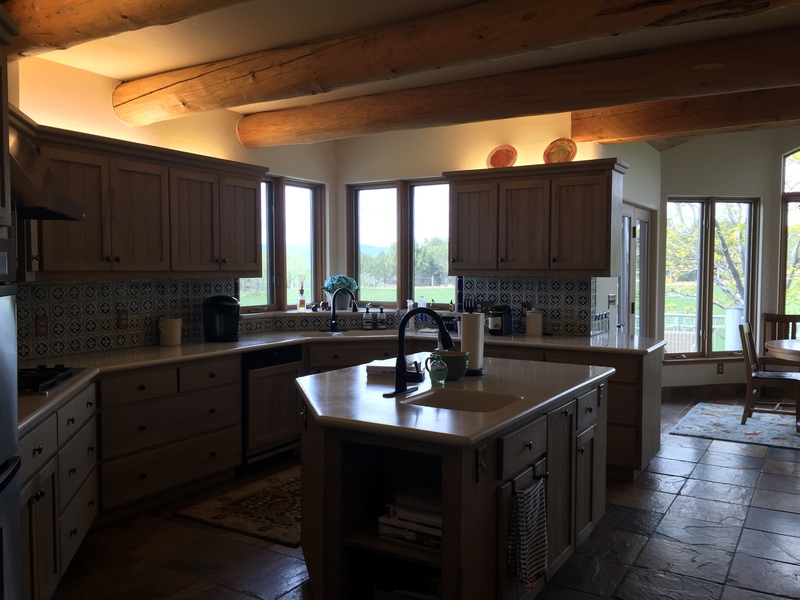 They chose custom painted cabinetry in charcoal and white and added warmth by using local barnwood on the vaulted ceiling and designing a statement range hood out of Wyoming snow fence. They selected quartz countertops with a marble look and a gorgeous mosaic tile in soft blues and greens to add sophistication and shine. 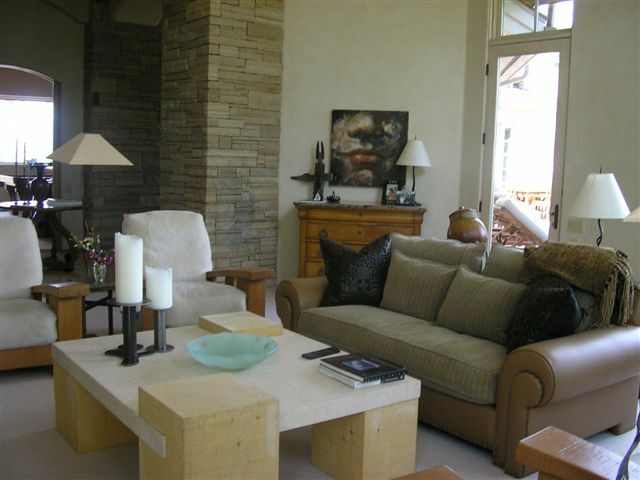 Susan found a unique furniture piece to use as an island to give the space that eclectic appeal that she loves. Restyle Design was involved in all aspects of the process from the overall design and project management to furnishing and accessorizing the finished space. 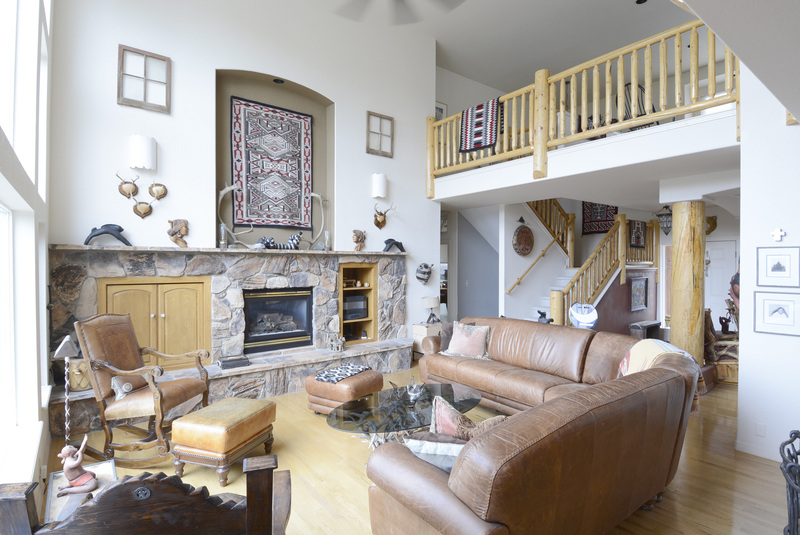 We were able to take a typical Snowmass home built in the mid 1990’s reflecting a mix of architectural styles and turn it into something outstanding from a design and functional standpoint for this family. By moving the bar to the living room we were able to increase traffic to an under utilized space. We were able to diminish some of the wasted square footage from all of the 45 degree angles by straightening them. Switching the direction of the staircase took you from landing in the pantry area of the old kitchen to landing at the tower, which was the best feature of the old floor plan. The interior was carefully curated in a collection of high-end contemporary furnishings with luxurious fabrics in shades of taupe and beige, all textural, minimal, clean and modern. There are “collector” furniture pieces such as the living room coffee table from Blackman Cruz, the living room art lamp from Gold Mountain Gallery, and the modern master desk from Cassina. Remarkable attention to architectural detail, all design elements, and room for an ever-expanding art collection, created the ultimate masterpiece for an art connoisseur and his wife. The eye is immediately drawn to the custom inlaid wood front door, leading through to the impeccable view. A harmonious color scheme to the landscape is complemented by the intricate angles in the architecture, reminiscent of the sacred rocks in the view beyond. The custom glass railing feeds the viewers flame of curiosity by drawing the eye up the staircase and to the catwalk above. Natural timbers caressed between metal and concrete act as art through the wonder of how it all works. Every detail was carefully and meticulously planned to capture its uniqueness, while simultaneously creating a subtle backdrop for all things beautiful. 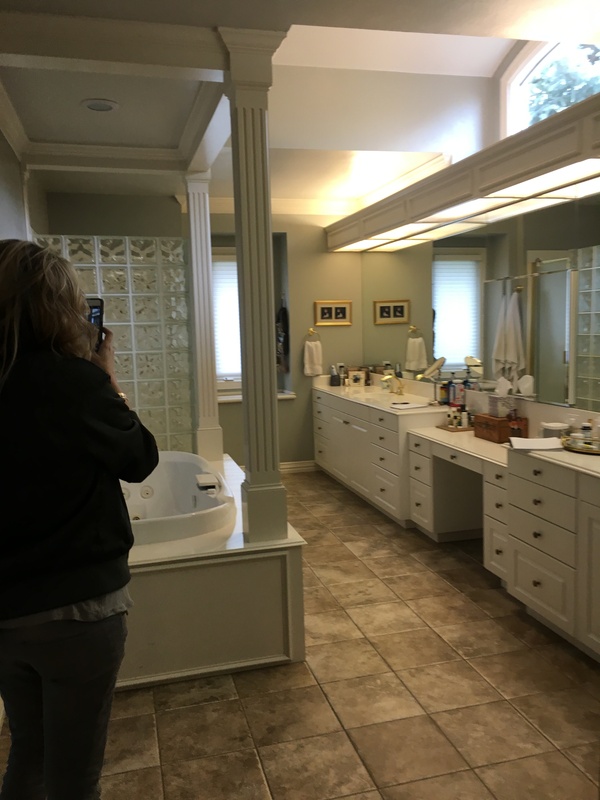 This was a master suite renovation for empty nesters who had an extremely outdated master bathroom. 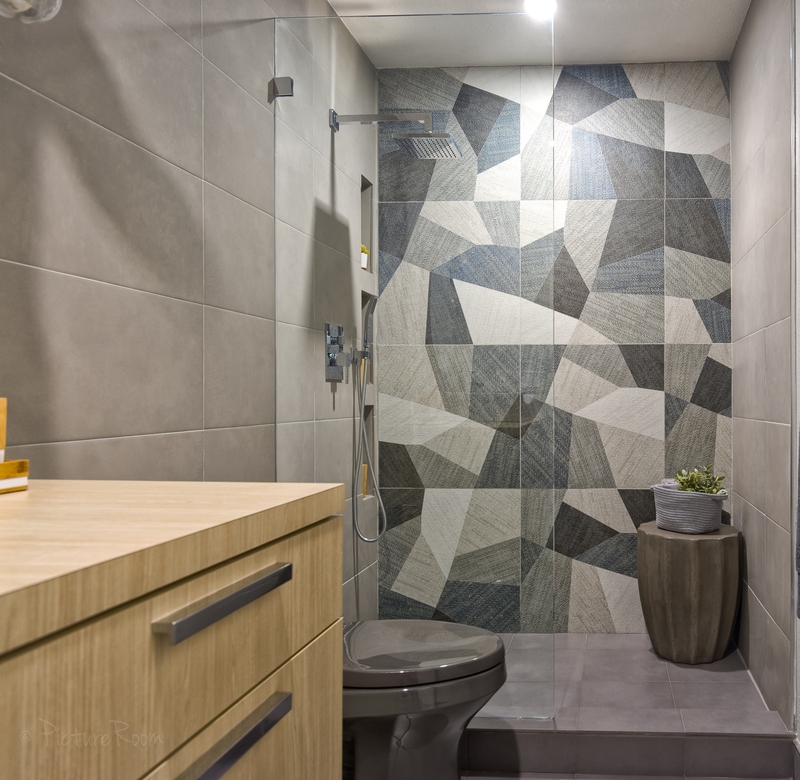 They were ready for a complete overhaul and requested a spa-like space with a wlak-in shower with no glass to clean, lots of natural materials, ample storage, and a ‘mix of old and new, modern and traditional, and one-of-a-kind’. We’re happy to report they’ve said their wishes has all come true! We removed the existing built-in bathtub and replaced with a free-standing tub. We built an oversized, walk-in shower and tiled floor to ceiling with Carrara marble tiles. 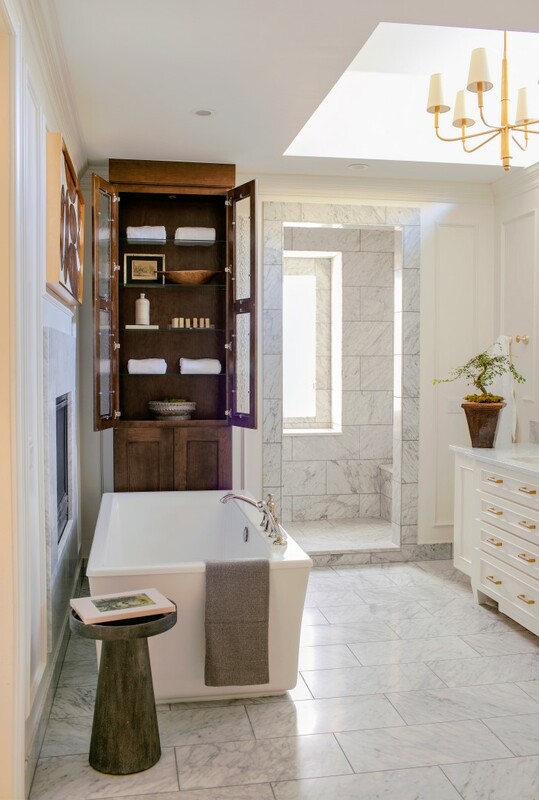 We carried the Carrara throughout the bathroom – the heated floors in the same marble tile and surrounded the built-in gas fireplace. To provide the requested additional storage, we commissioned an oversized vanity and a large built-in cabinet next to the bathtub. 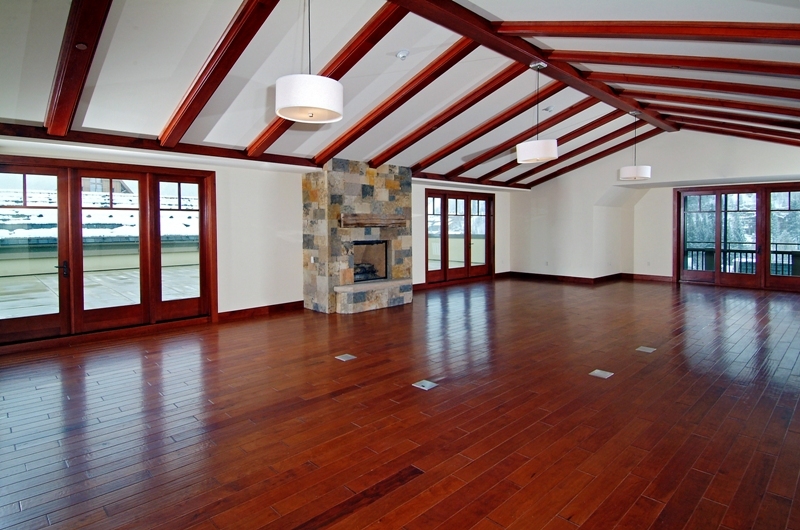 We selected a rich, warm wood for the built-in to add dimensions and interest to the space. To achieve the spa-like feel, we added a large chandelier to the roof skylight and organic and natural wood pieces throughout. The combination of natural light form the skylight, the simple and chic chandelier in gold, along with numerous sconces has taken the room from dark and heavy to airy, soothing and luxurious. 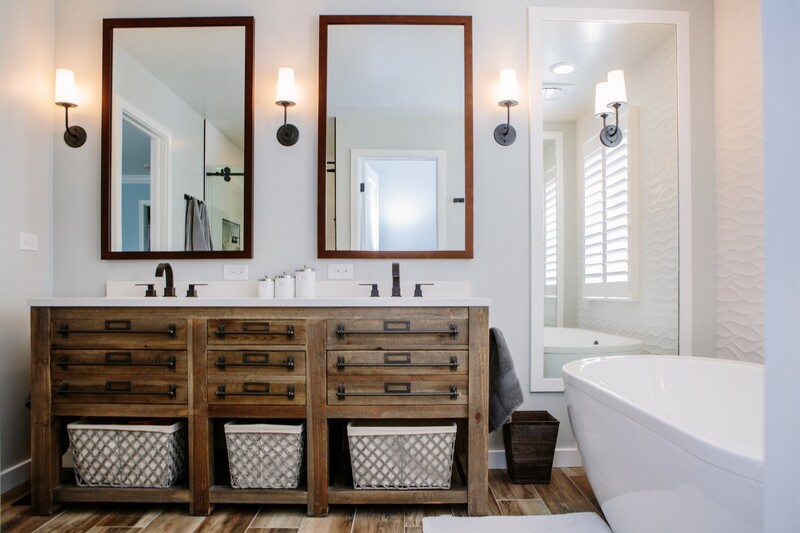 This master bathroom renovation transforms a builder-grade standard into a personalized retreat for our lovely Stapleton clients. 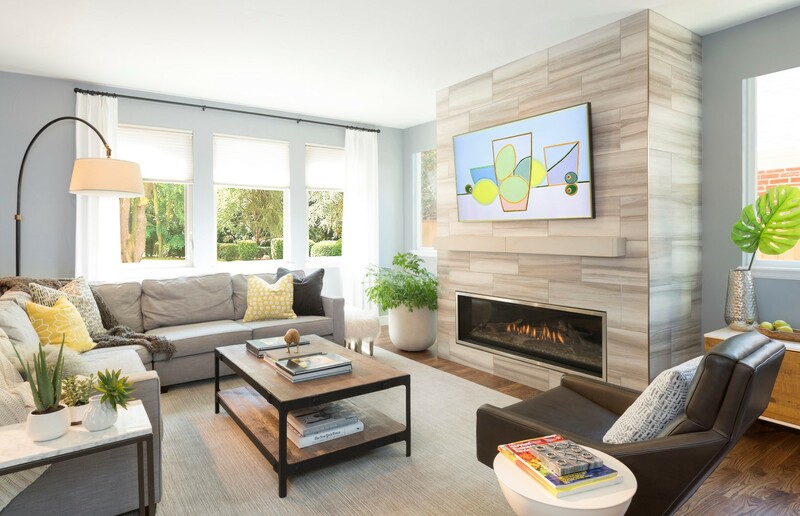 Recognizing a need for change, our clients called on us to help develop a space that would capture their aesthetic loves and foster relaxation. Our design focused on establishing an airy and grounded feel by pairing various shades of white, natural wood, and dynamic textures. We replaced the existing ceramic floor tile with wood-look porcelain tile for a warm and inviting look throughout the space. We then paired this with a reclaimed apothecary vanity from Restoration Hardware. This vanity is coupled with a bright Caesarstone countertop and warm bronze faucets from Delta to create a strikingly handsome balance. The vanity mirrors are custom-sized and trimmed with a coordinating bronze frame. Elegant wall sconces dance between the dark vanity mirrors and bright white full height mirrors flanking the bathtub. The tub itself is an oversized freestanding bathtub paired with a tall bronze tub filler. We’ve created a feature wall with Tile Bar’s Billowy Clouds ceramic tile floor to ceiling behind the tub. The wave-like movement of the tiles offers a dramatic texture in a pure white field. We removed the existing shower and extended its depth to create a large new shower. The walls are tiled with a large format high gloss white tile. The shower floor is tiled with marble circles in varying sizes that offer a playful aesthetic in an otherwise minimalist space. We love this pure, airy retreat and are thrilled that our clients get to enjoy it for many years to come! For this project it was all about making the space feel more contemporary while maintaining the cozy vibe of the mountains. We kept it fun with the pops of red within the space and continued that throughout the entire unit. 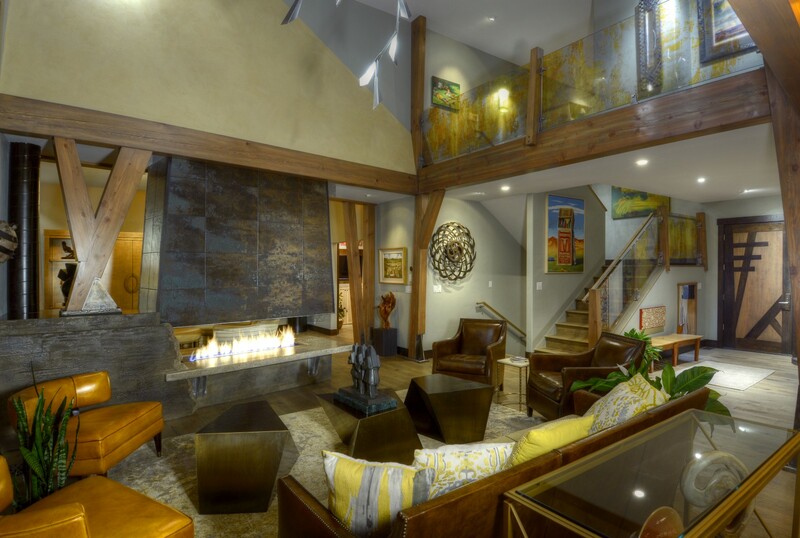 We wanted to create the perfect mountain ambiance in this space through texture. We used light and warmer wood on the walls to contrast the clean dark fireplace. We used fur and Nordic patterns to juxtapose the fresh white furniture. Incorporating darker woods in the furniture pieces tied into the beams on the ceiling, making the whole space cohesive. Who wouldn’t want to spend the night relaxing in this space after a long day of skiing?